Table settings make a tremendous impression on your guests and customers and most restaurants conform to standard table setting etiquettes so customers know what to expect when they sit down to their meal. As a restaurateur or caterer you will want to know exactly how to have your tables set for all dining occasions. The following guide provides todays most accepted rules and tips for setting the perfect table including informal dining, formal dining and setting a table for banquet service. 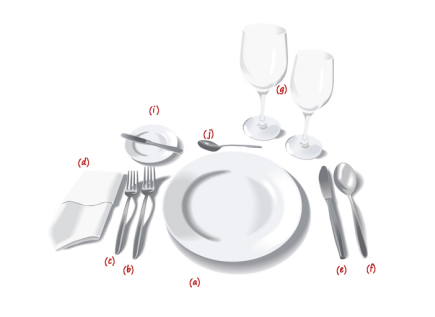 A general rule of table setting is that utensils are placed in the order of use from farthest from the dinner plate, utensils that are used first, to closest to the plate, utensils being used last, in an "outside-in" order. A second rule is that forks go to the left of the plate while knives and spoons go to the right. (a) The dinner plate is the first thing to be set on the table, with a napkin placed on top of the plate. 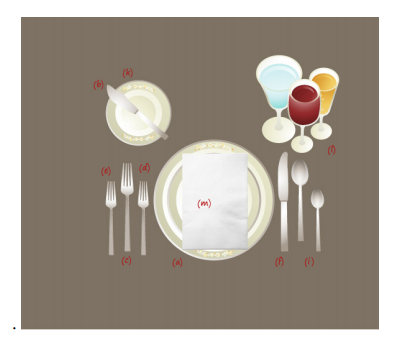 (b) The dinner fork is usually placed to the left of the plate. Since it is used for the main course; it will be usually be used last. (c) The salad fork, which is the smaller fork, is placed to the left of dinner fork and is used to eat salad or appetizers. Since the forks are arranged according to when you need to use them, if you were to serve dinner before the salad, then the salad fork would be next to the dinner plate and the dinner fork would be to the left of the salad fork. (d) The napkin is folded or put in a napkin ring and can be placed to the left of the forks or on the center of the dinner plate. 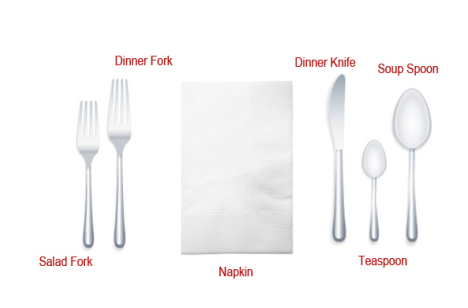 If you prefer, the folded napkin can be placed under the forks. (e) The dinner knife is set to the right of the dinner plate, with the cutting blade placed facing inward. If the main course is meat, a steak knife may replace the dinner knife. (f) The spoons are placed to the right of the knife. When soup is served first, the soup spoon will be placed to the far right of the dinner knife. The teaspoon or dessert spoon, (which will be used last) goes to the left of the soup spoon, next to the dinner knife. (h) If using a salad plate, it is placed to the left of the forks. A salad plate may be omitted if the salad is to be eaten with the meal, and it can be served directly on the dinner plate. However it is more acceptable to serve the salad on a separate plate to keep things neater. (i) If your restaurant uses a bread plate with a butter knife, then the bread plate goes above the forks, with the butter knife placed diagonally across the edge of the plate, with the handle on the right side and the blade facing down. (j) If using a dessert spoon and fork, then these utensils can be placed either horizontally above the dinner plate, with the spoon on top and its handle facing right and the fork below with its handle facing left; or beside the plate. If placed beside the plate, the fork goes on the left side, closest to the plate (because it will be the last fork used) and the spoon goes on the right side of the plate, to the right of the dinner knife and to the left of the soup spoon for the same reason. (k) When a coffee cup and saucer are used, then the coffee cup and saucer are placed above and to the right of the knife and spoons. A formal meal usually consists of an appetizer, first course, fish course,entrée, salad and dessert. ✓ Do not include any more than three utensils on either side of the dinner plate at a time, except when an oyster (or seafood) fork is being used in addition to the other three forks. ✓ Dessert spoons and forks are brought in on the dessert plate just before dessert is served. ✓ Everything should be geometrically spaced with every item at equal distances and all the utensils balanced. ✓ Make sure there is ample room between place settings. ✓ Before your guests are seated, the butter should be waiting on butter plates, the glasses filled with water, and the wine ready to be served. ✓ Place knives with blades facing the plate. The placement of utensils is guided by the menu, so be sure that you place the proper utensils in the order of how the meal will be served, with the utensil to be used by the first menu item being placed on the outside, and so on as the menu dictates in an “outside-in” order. (a) The service plate is the largest plate on your table setting. It is known by a few different names such as buffet plate, cover plate, lay plate and place plate and charger plate. This plate serves as a base on which to lay the plate for the appetizer course or soup course and is cleared from the table after the first or second course is finished. When the first course is cleared, the service plate remains on the table until the plate holding the entree is served, at which point the two plates are exchanged. The service plate can also serve as the base for several courses served after the entree. (b) The butter plate is a small plate that is placed above the forks, above and to the left of the service plate. (c) The dinner fork is largest of the forks and used for the main course so it is placed to the left of the dinner plate. (d) The position of the salad fork varies according to when the salad is being served. If the salad is served after the entree, then the salad fork is placed to the right of the dinner fork, next to the plate. If the salad is to be served first and the fish second, then the salad fork would be first, then the fish fork, and finally the dinner fork, closest to the dinner plate. (e) When fish is served as a first course, the small fish fork is placed farthest to the left of the dinner fork as it will be used first. (f) The large dinner knife is placed to the right of the dinner plate. (g) The fish knife is placed to the right of the dinner knife. (i) If soup or fruit is served as a first course, then the appropriate spoon is placed to the right of the knives. (j) If shellfish are to be served, the oyster fork goes to the right of the spoons. Note: it is the only fork ever placed on the right of the plate. (k) The butter knife or butter spreader is paced diagonally on top of the butter plate, with the handle on the right and the blade facing down. (l) There can be up to five glasses on a formal dining setting and they are placed so that the smaller ones are up front. The water goblet is placed directly above the knives. Just to the right goes a champagne flute; in front of these are a red or white wine glass and a sherry glass. (m) The napkin usually placed on top of the service plate, or instead of one in a formal dining setting. Since there are almost limitless options as to how to set up the buffet table at catered events, hotel dining rooms and restaurants, we have compiled a short list of suggestions to help the buffet style service run more smoothly and efficiently, while leaving the creativity up to you. ✓ If at all possible, set the napkin and silverware on the guest tables. An attractive folded napkin and shiny flatware make the tables look elegant and inviting. At buffet tables, the informal table setting is the most widely accepted format. ✓ If possible, set the guest tables to hold everything your guests need, except for their actual dinner plates. This makes the table look attractive and it also makes it much more functional. ✓ If possible, set up one or two condiment tables away from the main buffet as this will shorten wait time for guests at the main buffet. ✓ If possible, place the condiments, including salt and pepper, butter, sour cream, dressings, and more on the guest tables. This means a greater investment in owning more condiment servers, but it may be well worth your while to have satisfied customers. Sometimes it is the little conveniences that can keep guests happy without a great financial outlay on your part.